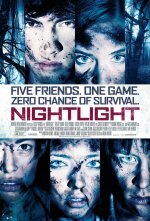 Nightlight release date was Friday, March 27, 2015. This was a Limited in theaters release. For years, the Covington forest has been shrouded in mystery, with a dark past as a final destination for troubled youths. Undeterred by the news of a classmate who recently took his life in those woods, five teens journey into the forest for an evening of flashlight games and ghost stories. But their plans go awry when the friends awaken a demonic presence, an unseen evil that will seize upon their deepest fears—and plunge them into a nightmare of absolute terror.